Mafbex takes you around the world in 5 days. 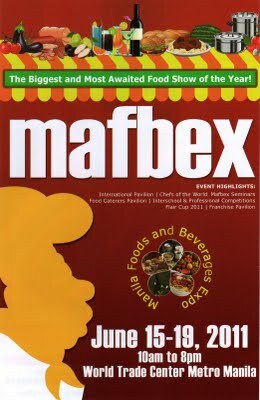 MAFBEX 2011 offers to take every foodie’s palate around the world on June 15-19 from 10AM to 8PM. You will surely be in for a food trip. A showcase of all thing food and everything else you need to know about food. Food enthusiasts, food lovers, anyone who eats any food like me will be there. So bring an apron... bring a napkin, you will surely be in for a treat. 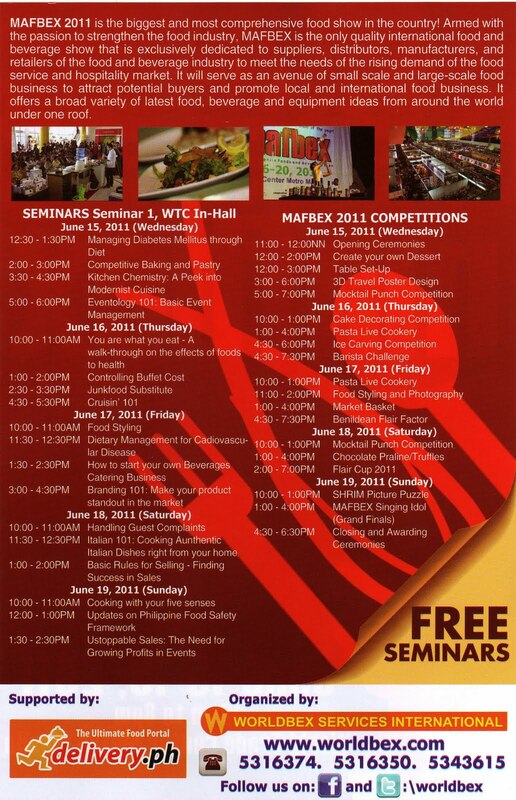 The 5-day food fest at the World Trade Center will draw in all sectors of the food and beverage industry by featuring a selection of food and beverage products and categories, innovative technologies, latest supplies, original and competitive services, and modern formulations from all over the globe. Get to explore the different tastes the Chefs of the World parade have to offer and the diverse showcases at the International Pavilion. For the benefit of the ABS-CBN Foundation Inc, WORLDBEX Services International brings everyone yet again, a world-class show. “MAFBEX is committed to impart a comprehensive access to excellent food and beverage products, events, newsworthy information as we showcase a host of food services and products from every corner of the world,” Mr. Joseph Ang, WSI Founding Chairman says. With almost 400 booths of both foreign and local exhibitors on the show floor, MAFBEX 2011 definitely is the biggest and most awaited food show of the year. There will also be interschool competitions co-organized by De La Salle-College of Saint Benilde School of Hotel Restaurant and Institution Management (SHRIM). It Includes competitions on Table Set-Ups, Mocktail Punch, Cake Decorating, Ice Carving to name a few. 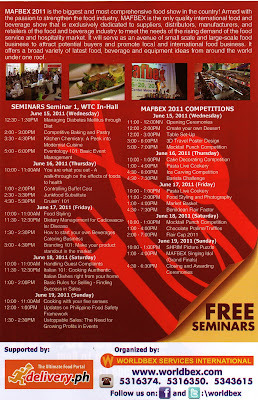 Now on its 5th year, MAFBEX is the food industry professionals’ choice because the show meets the increasing industry demands. Aside from the anticipated foodies (consumers), the event is expected to draw in suppliers, manufacturers, distributors and retailers to discover unique finds in food, ingredients, equipment, and services that would help their companies run more efficiently, offer new products, and improve profitability. The tradeshow also aims to serve as an avenue for small to large-scale food businesses in attracting potential buyers and promoting local and international food business. For more event information, you can visit www.worldbex.com or contact Worldbex Services International at (632) 531-6350/ 74; (632) 534- 1334; (632) 534- 3615. A Philippine based company, Worldbex Services International (WSI) is a duly registered events management company founded in 1996, and the leading exhibition and event organizer in the country. WSI have crossed the unique milestone of having organized quality trade and consumer shows in over 10 years of existence involving different countries like U.S.A., Europe, Middle East and Asia, and is set to expand their frontiers to other parts of the world. Propelled to perfection by an ardent desire to elevate the standard of event organization and management in the Philippines, Worldbex Services International seek to provide the cutting edge in the industry of event management and trade exhibitions determined to exercise expert management skills and creative marketing made visible in all endeavors for the emulation of the exposition industry worldwide. Worldbex Services International established the trend in the Philippines’ exposition industry, bringing to fore the latest innovations in the world of expositions. Worldbex Services International features world-class products, services and technology that harp on quality worthy of the attending trade visitors and exhibitors from all over the world.